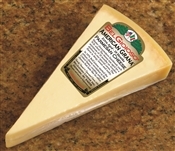 American Grana Cheese has an abundance of flavor, much deeper than Parmesan Cheese with a more granular texture. For the first time ever, this outstanding Italian cheese is made in the United States with the same craftsmanship and care as the original one. Aged a minimum of 18 months,it will bring an unbelievable flavor to any of your Italian dishes. American Grana Cheese, produced in traditional 70-pound wheels, is hand-turned twice a week to provide you with a remarkable flavor. Add complex new flavors to your favorite dishes or enjoy a flavorful, healthy snack with BelGioioso American Grana cheese. BelGioioso makes Grana cheese in America the same way it has been made in Italy for hundreds of years. Made from raw cow's milk from Wisconsin dairy farms and aged over 18 months while hand-turned in 70-pound wheels, Grana cheese develops a powerful flavor profile. 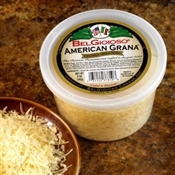 As a hard, granular cheese, BelGioioso American Grana cheese wedges are ideal for grating. Add a robust, nutty flavor to your favorite pasta, give boring breadsticks a sharp kick, sprinkle a bit onto salad for a richer taste or take off a chunk and enjoy just as a snack. For the first time ever,this outstanding Italian cheese is made in the United States with the same craftsmanship and care as the original one. Aged a minimum of 18 months,it will bring an unbelievable flavor to any of your Italian dishes. American Grana Cheese, produced in traditional 70-pound wheels, is hand-turned twice a week to provide you with a remarkable flavor. 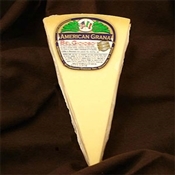 AWhether you are looking for a cheese for cooking, plating or snacking, BelGioioso American Grana Cheese is a delicious choice. With a full, bold flavor and a soft consistency that is easy to slice, cube or grate, BelGioiso American Grana Cheese is great on or with full dishes or hors d'oeuvres. BelGioioso makes American Grana cheese from their own special blend and recipe, aging the cheese for a minimum of 60 days and washing with salt and water to develop the soft pink rind. During the aging process, the bold flavors come out, making a perfect pairing with fruits or salads, a mouthwatering steak and cheese sub sandwich, or a healthy snack. For the first time ever, this outstanding Italian cheese is made in the United States with the same craftsmanship and care as the original one. Aged a minimum of 18 months, it will bring an unbelievable flavor to any of your Italian dishes. American Grana Cheese, produced in traditional 70-pound wheels, is hand-turned twice a week to provide you with a remarkable flavor. BelGioioso Imported Grana Padano cheese is made from pure cow's milk and aged in the same way Grana Padano cheese has been made for centuries. Similar to Parmesan and Parmigiano Reggiano cheese, Grana Padano is a sharp, fragrant cheese with a slightly sweet aftertaste. As it is aged, Grana Padano cheese gains a full flavor profile, ranging from sweet to nutty and a granular texture. The cheese is a light yellow with a hard, darker yellow rind. With twelve 8oz wedges, you can add BelGioioso Imported Grana Padano cheese to your cheese plate, sprinkle over pasta, add to salad, shred over potatoes or meats, and much more.